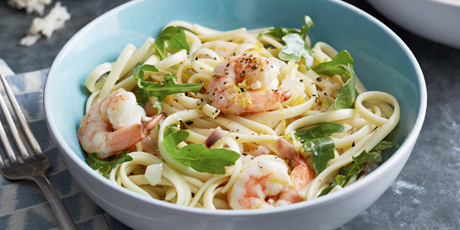 A bright dish with shrimp, arugula, garlic and shallots over linguine and drizzled with an easy lemon oil. 1. Combine the olive oil and the lemon zest in a small bowl and reserve. 1. Bring a large pot of salted water to a boil over high heat. Add the pasta and cook until tender but still firm to the bite, stirring occasionally, about 8 to 10 minutes. Drain pasta, reserving 1 cup of the cooking liquid. 2. Meanwhile, in a large, heavy skillet warm the olive oil over medium heat. Add the shallots and garlic and cook for 2 minutes. Add the shrimp and cook until pink, about 5 minutes. Add the cooked linguine, lemon juice, lemon zest, salt, and pepper. Toss to combine. Turn off the heat and add the arugula. Using a mesh sieve, strain the lemon zest out of the reserved lemon olive oil and add the oil to the pasta. The zest can be discarded. Add some of the cooking water to desired consistency. Add the chopped parsley to the pasta and toss to combine. Serve immediately.